This past Saturday, Aug. 28, conservative talk-show host Glenn Beck marched on Washington. The "nonpolitical" rally, titled "Restoring America," celebrated the United States and its founding, pushed for a return to constitutional principles and featured both Beck and former Alaska governor Sarah Palin as speakers. The rally happened to fall on the anniversary of Dr. Martin Luther King's "I Have a Dream" speech, one of the most historic and memorable D.C. protests in American history. But the first significant demonstration on Washington is widely believed to have been Coxey's Army in 1894, which literally began as a march from Massillon, Ohio, and was led by Jacob Coxey. After the economic difficulties of the Panic of 1893, Coxey gathered some workers from the Ohio sand quarry he owned and led them to Washington to protest the federal government's failure to assist working Americans. By the time Coxey got to Washington, the group  now 500 men strong demanded that the government hire them to work on public projects such as roads and government buildings. The faux army was greeted by the U.S. Army, and Coxey was arrested for walking on the grass of the U.S. Capitol building when he attempted to make a speech. All was quiet for a couple of decades. Then, the day before the 1913 Inauguration of President-elect Woodrow Wilson, the National American Woman Suffrage Association held a demonstration in support of voting rights for women. With 20 floats, nine bands and 5,000 marchers (including author and activist Helen Keller), the protest was more a parade than a demonstration. But as it got closer to the Inauguration site, some men attempted to block the marchers, shoving and tripping them and yelling epithets. Despite the fracas, the march was an important step in women's gaining the right to vote seven years later. While a handful of demonstrations were held over the next few decades, including another Coxey's Army protest (organized on the 20th anniversary of the first one and led by the same gentleman) and a Ku Klux Klan rally of an estimated 35,000, it wasn't until the volatile 1960s that the idea of a march on Washington as a political tool truly came to pass. 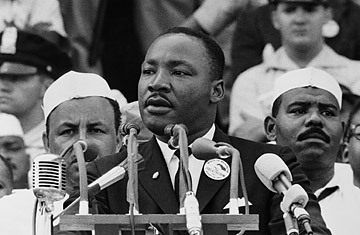 King gave his "I Have a Dream" speech to an audience of 250,000, by far the biggest crowd D.C. had ever seen. AntiVietnam War marches became an almost annual rite until the early 1970s, and the shootings at Kent State University brought marchers (who also protested President Richard Nixon's bombing of Cambodia) to the National Mall. In 1974, antiabortion protesters started the first March for Life, following Roe v. Wade, and 1979 saw the first gay-rights march. Washington marches took a different turn following the divisiveness of the 1960s and early '70s. While the issues Americans protested did not become less important, they certainly became much more compartmentalized. Just take a look at the 1979 Tractorcade (in which 6,000 family farmers drove tractors to the mall to protest farm policy), the 1981 Solidarity Day March (led by the AFL-CIO to protest Reagan Administration labor laws), the 1982 Washington Anti-Klan Protest and the 1986 Great Peace March for Global Nuclear Disarmament. The 2000s saw even more splintered groups, such as the Million Mom March (a play on the huge Million Man March in 1995), the Brides March Against Domestic Violence, and Project MARCH, which raised awareness of colon cancer. The policies of George W. Bush took center stage in the 2000s, with numerous demonstrations objecting to the Iraq and Afghan wars and even a counterinaugural march to protest Bush's second term. Since the election of Barack Obama and the onset of the Great Recession, though, the heart of Washington marches is Washington itself. The Tea Partyers on the right  with their focus on less government and lower taxes  are the present-day equivalent of what the '60s anti-war protesters were on the left: impassioned, determined and uniquely American. Watch TIME's video "Threats, Protests, Floods and Executions: The Acoustic News."